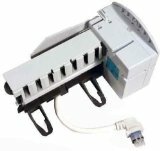 A genuine OE part that can be used for both a new installation, or to replace a broken unit, the IM6 GE icemaker kit helps ensure your refrigerator dispenses the clean and cool tasting ice you deserve. One of the most effective icemakers currently being produced by GE, this unit includes and electronic control board, on/off switch, cube regulator adjustment and an anti-jamming feature that automatically melts jammed ice cubes. Kit contains everything needed for quick and easy installation. Serve the great tasting ice you deserve by ordering the IM-6 GE refrigerator icemaker kit from us today. Order online from us by 4pm CST for FREE same day shipping.